Princess Cruises has announced two preview cruises aboard Royal Princess, giving passengers a unique opportunity to get a taste of the new ship before its official inaugural voyage. The June 9 and June 14 cruises will sail roundtrip from Southampton on a two-night itinerary featuring a call in St. Peter Port, on the island of Guernsey. Passengers on the short sailings will be able to sample Royal Princess’ many ground-breaking features, including the dramatic over-water SeaWalk, Princess Live! television studio, and plush new poolside cabanas before the ship’s inaugural sailing on June 16, 2013. Both voyages will go on sale on January 29, with limited availability. Per person cruise fares start at $530 for an obstructed-view balcony stateroom. The 3,600-passenger Royal Princess is a new-generation ship for Princess Cruises. 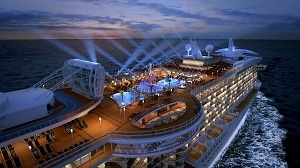 Among the special features found on board will be a greatly expanded atrium, the social hub of the ship; a dramatic over-water SeaWalk, a top-deck glass-bottomed walkway extending more than 28 feet beyond the edge of the vessel; plush private poolside cabanas that appear to be floating on the water; the new Princess Live! television studio; a pastry shop; a special Chef’s Table Lumiere, a private dining experience that surrounds diners in a curtain of light; and balconies on all outside staterooms. The ship’s 2013 maiden season will include cruises on the line’s signature Grand Mediterranean itinerary throughout the summer, followed by Eastern Caribbean cruises beginning in the fall. 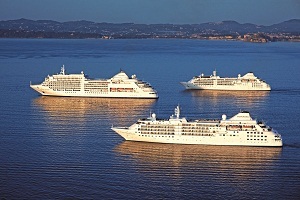 In its continuing mission to provide guests with more choices, ultra-luxury Silversea Cruises has just announced a new collection of eight shorter cruises for 2013. These convenient four- to seven-day voyages to Northern Europe and the Mediterranean are designed for time-strapped working professionals, travelers who like to combine a cruise with a land program, and individuals who may be new to luxury cruising and would like a taste of Silversea’s award-winning, all-inclusive experience. Northern Europe: Silver Cloud, June 15 – 19, Hamburg to Copenhagen, with calls in Warnemünde (Rostock) and Helsingborg. 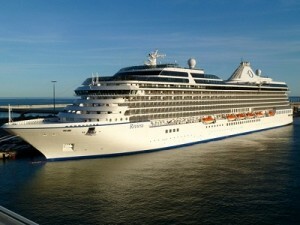 Mediterranean: Silver Wind, March 16 – 20, Barcelona to Rome, with calls in Monte Carlo and Livorno. Mediterranean: Silver Wind, May 14 – 18, Rome to Monte Carlo, with calls in Bonifacio, Calvi, and Livorno. Mediterranean: Silver Wind, March 11 – 16, Lisbon to Barcelona, with calls in Málaga, Cartagena, and Valencia. Northern Europe: Silver Cloud, June 9 – 15, Southampton to Hamburg, with calls in Honfleur, Oostende, Antwerp, and Amsterdam. Mediterranean: Silver Spirit, April 16 – 23, Lisbon to Barcelona, with calls in Portimão, Cádiz, Málaga, Ibiza, and Valencia. Mediterranean: Silver Spirit, May 25 – June 1, Athens to Rome, with calls in Katakolon, Corfu, Kotor, Dubrovnik, and Sorrento. Aboard Silversea’s intimate, all-suite ships, guests enjoy spacious ocean-view accommodations, sumptuous gourmet cuisine, the personalized service of a butler, and a generous selection of all-inclusive shipboard amenities, including complimentary beverages, wines and spirits served throughout the ship, stocked in-suite beverage cabinet, and all gratuities. Initial pricing was expected to be in the $16-$18 range. Due to strong investor reception, the initial stock offering price will be $19 a share. UBS and Barclays are the lead underwriters on the offering. Many investors see this as a strong move for the company as it continues to grow and expand. The proceeds from the offering, estimated to be about $447 million, are being used to pay down some of the company’s $2.9 billion of debt. Norwegian Cruise Line currently operates 11 ships, with three ships on order over the next three years, including an option for a fourth ship. 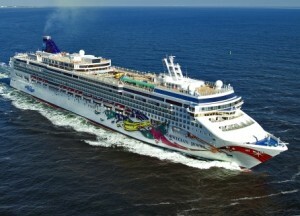 Norwegian’s newest ship, the 4,000-passenger Norwegian Breakaway, debuts in May 2013. On January 6, 2013, Oceania Cruises marked its 10th anniversary, kicking off a year of special events, designated sailings, engaging social media initiatives and onboard celebrations. Founded by cruise industry visionaries Frank Del Rio, Bob Binder and Joe Watters in 2003, the line’s mission was to deliver destination-rich itineraries, “best in class” cuisine, an inviting country club atmosphere, and luxurious accommodations all at an extraordinary value. With the addition of Marina in 2011 and Riviera in 2012 to the fleet of Regatta (2003), Insignia (2004)and Nautica (2005), Oceania Cruises has built an entirely new segment of the industry with its elegant, award-winning, mid-size ships and exceptional personalized service. Guests will have the opportunity to sail with company founders and top executives on four specially designated “Anniversary Sailings.” Each voyage will feature a different executive who will host an anniversary cocktail reception, celebratory caviar brunch and gala dinner with private label 10th anniversary wine served complimentary. Marina’s 14-day Scandinavian Serenade departing from London to Stockholm on June 11, 2013 with Bob Binder. In addition to a 3-day stay in St. Petersburg, Russia, the cruise visits Amsterdam, Netherlands; Oslo, Norway; Copenhagen, Denmark; Berlin (Warnemunde), Germany; Riga, Latvia; Tallinn, Estonia and Helsinki, Finland. Riviera’s Italian Escapade with Kunal S. Kamlani, departs on July 3, 2013, from Rome for a 10-day voyage to Venice. Ports include Florence/Pisa/Tuscany (Livorno), Italy; Sorrento/Capri, Italy; Amalfi/Positano, Italy; Taormina (Sicily), Italy; Corfu, Greece; Kotor, Montenegro and Dubrovnik, Croatia. Regatta’s 7-day Coastal Alaska with Frank Del Rio on July 5, 2013 from Seattle to Seattle with calls at Ketchikan and Wrangell, Alaska; and Prince Rupert, Canada. Nautica’s Roman Legends with Joe Watters, departs September 6, 2013 for a 10-day voyage from Barcelona to Athens. Visits include Provence (Marseille), France; Portofino, Italy; Florence/Pisa/Tuscany (Livorno), Italy; Rome (Civitavecchia), Italy; Sorrento/Capri, Italy; Taormina (Sicily), Italy; Ephesus (Kusadasi), Turkey and Santorini, Greece. The company will celebrate fleet-wide with a special 10th Anniversary dessert called ZEN, a Manjari Chocolate Bar with Milky Gianduja-Yuzu and Hazelnut Croquant featured in the Grand Dining Room and a menu of Canyon Ranch SpaClub® 10th anniversary treatments available on all ships.